Unlock your Sharp phone from the convenience of your home or office. doctorSIM's unlocking services are perfectly legal. The phone's warranty will remain intact. Permanently unlock any Sharp model. How to unlock my Sharp phone with doctorSIM? 1. Submit your unlocking request from the comfort of your home. 2. We'll send you an unlock code along with simple instructions on how to complete the unlocking via e-mail. 3. Insert a SIM card from a non-compatible network provider and type in the unlock code. Your Sharp phone is now permanently unlocked! What are the benefits of having an unlocked cell phone? 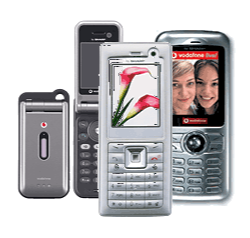 There are many benefits to owning an unlocked cell phone, with the main advantage being the convenience of using it on any compatible GSM network in the world. With an unlocked phone, you can switch networks whenever you like to benefit from better rates or current promotions, as well as avoid roaming fees when you travel overseas. An unlocked Sharp cell phone also has a higher resale value if you ever decide to sell it in the future. Are your unlocking services legal? Is the doctorSIM website secure? Unlocking cell phones by IMEI is 100% legal. In fact, this method is the only official and recommended method by Sharp and the network providers themselves as it won't damage the phone or void the warranty. We also guarantee that each of the transactions performed through doctorSIM is totally safe. All operations involving personal or banking data transmission are through a secure environment. For more information on how our VeriSign, PCI DSS, and HackerSafe certifications look after your personal details, visit our section on Security and Protection. Do your unlocking services permanently unlock the phone? What happens if the phone prompts for the unlock code again at a later date? doctorSIM's unlocking method via IMEI is permanent. The phone will never relock even if you restore your Sharp phone to factory settings. In the exceptional case the phone prompts for the unlock code again, simply retype it as the code never expires. Will an unlocked Sharp work on any network in the world? Once your Sharp cell phone has been unlocked by doctorSIM you'll be able to use it on any compatible GSM network in the world as long as it has not been blacklisted by the original operator. What happens if you cannot unlock my Sharp cell phone? If we cannot unlock your phone, and all the details you provided were correct, we will issue you a full refund. Just make sure the information you send us is correct because the unlocking process is fully automated and the unlock code delivered to you will be based on that information. Placing a cell phone on the blacklist is an additional security measure by the carrier preventing the phone from working properly. If you are unsure if your Sharp has been blacklisted, find out instantly with our blacklist phone check. Can I unlock my Sharp if it has been reported or on the blacklist? If your Sharp has been reported stolen, lost or due to unpaid bills, you should contact the network provider to which the phone is locked to have it removed. You can still unlock your phone with doctorSIM, but it will not work properly until it has been whitelisted. Safely unlock your Sharp cell phone online. Unlock your phone in three easy steps fast. Your cell phone will never relock to Sharp or any other network carrier. We have the lowest prices. You will not lose the warranty of your Sharp. We have invested heavily in quality controls and certificates guaranteeing your safety online. Our permanent unlock codes are also valid abroad. One unlocking service valid for all Sharp models. doctorSIM is the number one unlocking company in the world.